Home / Bigger is not necessarily better? Using size as the sole or even primary measure of success risks wasting limited political and social capital on protecting areas that don’t maximise conservation benefits. That’s the warning of a new commentary we led (while based at CEED) in Nature Ecology and Evolution (Barnes et al, 2018). Focusing on area is dangerous because we risk protecting a lot of land and sea with limited biodiversity benefits. International targets adopted under the Convention on Biological Diversity (CBD) include the protection of at least 17% of land and inland water, and 10% of coastal and marine areas by the year 2020 (Aichi Biodiversity Target 11). Special emphasis is placed on areas of high ecological importance, but a frenzied race to hit a spatial percentage target risks ignoring impacts which undermine the underlying conservation goal (see Fig 1). Figure 1: Four possible perverse outcomes from pursuing percentage targets as a primary measure of success – poor placement, overstatement, underachievement and warped values. See Barnes 2018 for details on each category. 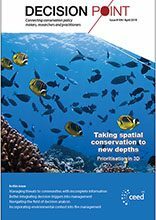 Impact on biodiversity is broadly recognised as the crucial measure for protected areas by scientists, conservationists, and policymakers, but current policy discussions around global protected area targets continue to focus heavily on area under protection, rather than outcomes for conservation. Using size alone to measure conservation success is like counting the beds in a hospital and ignoring whether or not the patients are getting better. We don’t just need more protected areas, we need to maximize our return on protected area investments. This means parks and reserves established in the right places, protecting as many species, habitats, and ecological functions as possible. 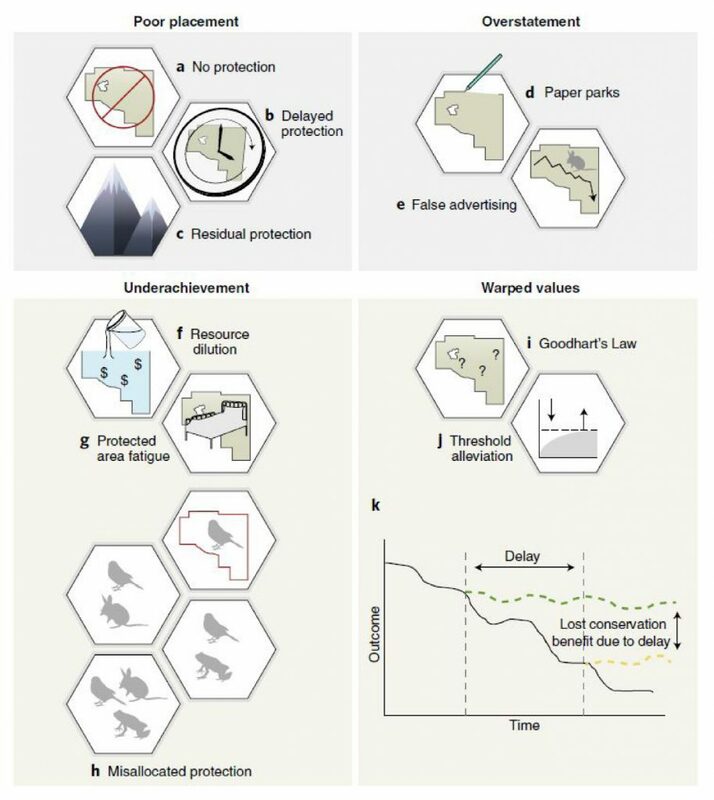 The danger of so-called ‘paper parks’ – protected areas that exist on maps but fail to deliver significant conservation benefits – extends beyond just local inefficiencies. Their establishment often leads to an exaggerated public perception of success, fostering complacency and excusing inaction elsewhere. Alternatively, these areas lack of demonstrable conservation impact can reinforce arguments against protecting other areas – often ones of critical ecological importance. The way international policy targets are currently designed, we risk ‘locking-in’ a globally protected area estate designed to maximize area, not impact, particularly in countries where public or political appetite for expansion of parks and reserves is limited. By creating parks with limited impact, we reduce the benefits people see, and with that we lose social license for conservation. We argue that policymakers, governments, and NGOs must stop measuring protected area success on size alone and start talking about things like how many fish will stay in the sea to grow and reproduce, or how many pangolins might be saved from wildlife trade. If we want future conservation targets to focus on measurable outcomes beyond area, we need to act now. We know we can’t protect everything, so let’s make sure what we do protect gives us the biggest return possible. Barnes MD, L Glew, C Wyborn & ID Craigie (2018). Prevent perverse outcomes from global protected area policy. Nature Ecology and Evolution. Madden led a Science paper on this very topic way back in 2009, and you can read about it in Decision Point #25 (p4,5).